This is a page about North Ronaldsay sheep. To be honest, when the plane touched down (and burst a tyre on the gravel, by the way – see the other North Ronaldsay page, link below) I never thought I would be writing a page about, well, just sheep. But if you spend time on this most northerly of the Orkney islands, then North Ronaldsay sheep kind of make their way into the frame, often quite literally when you are taking pictures. These beasties have shaped the island’s past and still impact on the present. The annual rounding up of the North Ronaldsay sheep also represents one of the few cooperative farming activities left in Scotland. Furthermore, the North Ronaldsay sheep are a living link with our ancestors. Well, maybe not your ancestors, but I fondly imagine my forebears were northern folk and might have kept a few sheep before they took to the sea. Bones of the same kind of sheep found today on North Ronaldsay have been found at Skara Brae, the famous Neolithic village discovered on mainland Orkney and which dates from c. 5000 years ago. Make no mistake; these are unusual beasties that have rarity value. Perhaps as a consequence, with only about 500 breeding female sheep registered in the UK, the breed has official ‘endangered’ status. These short-tailed, horned sheep are characteristic of a type found in Scandinavia and were probably brought to the island by the first settlers. Pictured here, the second North Ronaldsay lighthouse, with cafe, exhibition, spinning mill in the buildings adjacent. Also on the skyline is a cruie or planticruive, centre, and foghorn, right. How many sheep on North Ronladsay? However, there are, apparently, still 3,700 North Ronaldsay sheep on the actual island itself. Certainly, if you visit North Ronaldsay, that figure can be believed. Every time you look over the wall (or keek oer the dyke, as I would prefer to say) you seem to be faced with a sheep, staring balefully back while grimly chewing on some seaweed it has chiselled off the barnacled rocks. Anyway, as you may have read on the main North Ronaldsay page, uniquely amongst the islands of Orkney and beyond, there is a large dry-stane dyke all around this island. It is officially recognized as an important monument by Historic Environment Scotland (the government agency responsible for protecting our built heritage). However, many of these northern islands have a ready source of ‘Orkney flags’ – flattish and easily split rocks for building purposes – as you can see from the height of the island wall. To be honest, for the visitor, this historic dyke sometimes gets in the way. Perhaps the sheep think the same. For all I know, these North Ronaldsays hatch dastardly plots to break into the island and eat rich grasses but are always fooled by the humans who try to keep the wall in good condition. The 13 miles (21km) of wall dates from the 1830s when it was built so that the pastures of the interior could be preserved for more valuable cattle. The sheep were ‘exiled’ and ironically, because of this, the breed has remained true to its origins and not been cross-bred with ‘modern’ sheep. I thought by now you’d seen enough sheep so here are some Arctic terns. On North Ronaldsay, they seem to co-exist with the sheep. They dive-bomb them when they come too close to their nests. The Arctic tern has the longest migration of any bird in the world – all the way to the Antarctic. So when you’d flown back you’d not take kindly to getting your nest trodden on, no matter how rare the sheep that did it. 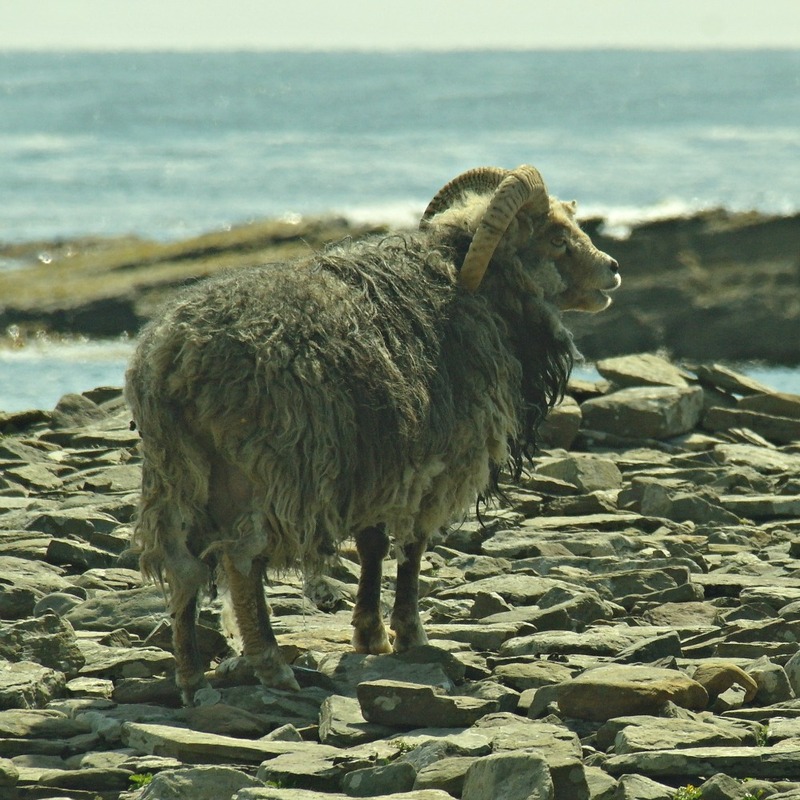 North Ronaldsay sheep are often described as primitive. Frankly, all the sheep I have ever encountered in Scotland both on field and hill seem to be some kind of non-discriminating woolly maggot. So if the local sheep hereabouts are primitive, I do rather wonder what a sophisticated sheep must be like. But treat that as an aside. I expect primitive in this sense must mean unchanged since Neolithic times. Anyway, the North Ronaldsay sheep are still important in the story of this, the most northerly of the islands of Orkney. Today, thanks to the installation of a ‘mini-mill’- basically, scaled down spinning equipment for cottage industry – in the complex of lighthouse buildings, visitors can buy North Ronaldsay wool produced on the island. It comes in a variety of natural shades – just about anything from white to black via fawns and browns. If you can, it’s good to slip in the word ‘moorit’ when describing sheep that are brown-ish, as it’s a Scandinavian word linked to the colour of moorland but usually applied to a particular shade of sheep. Though principally useful for their wool, a bit of a mystique has built up around North Ronaldsay mutton. At least, that is the only explanation I can think of for the fact that it appears to retail at double the price of the most excellent local Orkney ‘ordinary’ lamb. And a mainland Orkney farming lass we spoke to who keeps her own sheep (but not the North Ronldsays) says she just doesn’t like the taste and that it is very gamey. Perhaps it is the mutton equivalent of Laphroaig whisky. But it is still a tremendous brand that is gradually raising its profile. Anyway, if you’d like to find out more about the North Ronaldsay sheep, then I consider that quite unhealthy. Instead, you should see what else Orkney has to offer on some of the other islands, such as Rousay. Or go off to the main North Ronaldsay page, where the local sheep keep sneaking into the pictures. Or go to the main Scottish islands page. Oh, all right then, just one more sheep picture...but just a little one. Linklet Bay beyond.